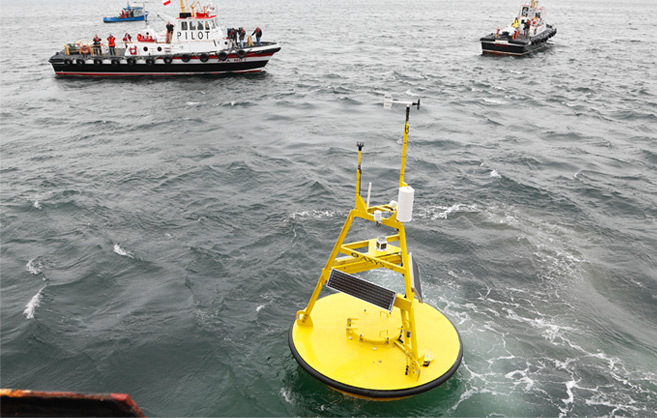 Meteorological and oceanographic data transmitted from the buoy will also be used in ocean/climate research regionally, nationally and internationally. Start-up funding is being provided by Transport Canada, the Nova Scotia Department of Economic and Rural Development and Tourism, and MEOPAR, in addition to in-kind contributions from AMEC Environment & Infrastructure, the Canadian Coast Guard and Canadian Marine Pilots’ Association. The Atlantic Pilotage Authority and the Halifax Port Authority have committed to fund the annual operating and maintenance costs (estimated at a total of $120,000 per year) for a period of 10 years.